Enjoy an unforgettable experience along with spectacular views of the Cordillera Blanca right from your room. Our spacious private rooms offer 24 hours hot water,comfortable new mattresses and carpeted floors.Clean bed linens and towels are also included.Start each morning with a FREE hot breakfast made from scratch including coffee,tea,juice and vegetarian options. We also speak English and can assist you in making any arrangements needed. 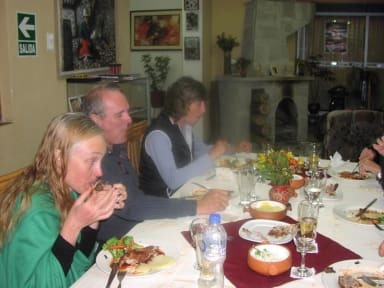 As an experienced mountaineer of the Cordillera Blanca I can assist you in making arrangements for climbing or trekking including the Santa Cruz Trek. We also offer free Bus Station pick up, just e mail us your itinerary. 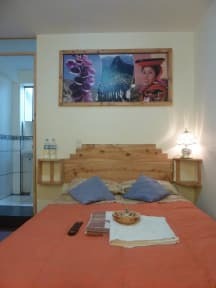 Other amenities include computer workstation,Free WIFI, TV and a wide array of bools on the area. Our family would like to make this your Home away from Home. NEW: Recently we remodeled our hostel with an spectacular terrace and our cozy fireplace. 2015 NEWS: We are opening our recently inaugurated third floor with strenous rooms . Perfect for persons who are looking for quiet places for rest . He quedado muy satisfecho principalmente por el personal siempre dispuesto a ayudarte. La ubicación es un poco lejos pero después todo excelente ! Recomendado. Un poco alejado del centro pero nada que un taxi en 10 minutos pueda solucionar. El agua caliente es muy escasa, la presion del agua tambien es baja, no hay televisor ni DVD en el cuarto.